Apparently there were some delays in getting these decorations up, but now they’re in place, I do think they look rather splendid, don’t you? Anybody know if this lights up at night? In today’s news, the Herald Sun reports that from January, Myki cards are to be reduced in price to $6 ($3 concession) and the $9.80 refund fee removed, meaning they’ll be fully refundable for tourists. Update: However refunds will not include the initial $6/$3 fee for the card, and the refund will be issued by a cheque in the mail rather than over-the-counter, making the scheme useless for overseas tourists. Yearly Metcards to be withdrawn, and it sounds like other Metcards (Monthlies, Weeklies, 10×2 hours?) will also be phased out in the next few months, to get more people moving over to Myki. And I understand the retail network will expand and move ahead on selling cards, as will station and tram superstop vending machines. It’s good that moves are finally afoot to get back onto one ticket system — given the costs and confusion around running two — but there are still questions over whether transitioning passengers will see the level of staff assistance they need, and what will happen with on-board (on trams and buses) purchase of tickets. Will there be any kind of option at all, or will we see mass fare evasion? And will they ever fix the single beep sound problem so we can tell the difference between touch-on and touch-off, even if we’re in a hurry/not looking at the screen/unable to see it due to sun glare? 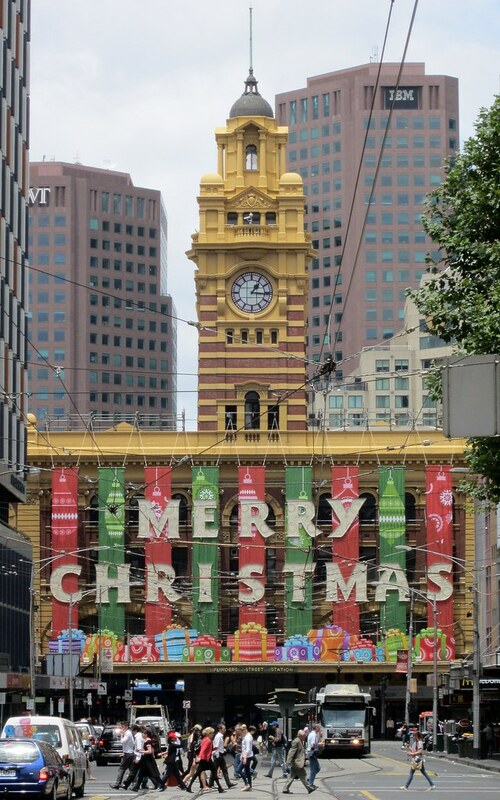 Next → Next post: If Myer went totally online, would the Christmas Windows turn into a web site? I’ve asked mykimate on twitter if the refund option means you also get the $6.00 back that you paid for the card, or is it just the $9.80 fee (which came off any remaining card balance) that has only been abolished? Be interesting to see what the answer is. Comment number 6 on the Herald Sun website is quite telling. I can’t top up on the tram. I can’t top up at my tram stop. It takes 48 hours to put money on the MYKI. No more spontaneous trips into town… May as well drive. The $9.80 refund is a good start. They really need to have another free Myki period to give people a chance to avoid the fee. as usual you raise some good questions – and, as usual, it appears the myki people haven’t thought of any answers! Daniel, what’s the current policy on refunds due to being ejected from a short-running tram? Last night there were serious Issues on the 96 resulting in some passengers being forced off a tram at Russell St, then again at Pigdon St as Operations tried to sort out the mess. Unfortunately some of the irate passengers opted to take it out on the driver verbally which I don’t condone, but in general, what recourse do people have in this situation? My last communication with Myki was to use Metcard because Myki consistently overcharges for my travel pattern.Sounds like time to stock up on Metcard periodicals. @Julian, users like that should just set up an auto topup for $10, triggered at a $10 balance. Casual use problem solved – you’re actually carrying even less credit around than on an average 10×2 hourly. Some could, but you obviously don’t think like a student! Having recently lived in a share-house where I was the only “worker” (everyone in the house worked a bit, but all were full times students) money was tight. The idea that you would necessarily have $10 in your account at all times was a joke, the idea that you would want $10 to be withdrawn from your account inadvertently was even sillier as it would likely result in the sorts of situations where you can’t pay for groceries at the checkout. On the other hand, the house had a constant rotation of money being leant between each other so that people could do things like pay for Metcards. That wouldn’t be an option any more. The result in that house wouldn’t have been people opting to drive as there was no cars, it would have been opting to fare evade because it would have been the only possible option. I’m not saying this would be the situation for everyone, but certainly not being able to top-up nor buy short term tickets is going to affect a lot of the population, not just small groups. A cheque in the mail? Seriously? Absurd! I was under the impression that the myki cards were priced as they were so as to avoid a situation where people could buy the card, load it with $1, take an expensive trip, and then dispose of the card (in negative balance) and get a new one. How is this problem going to be avoided with the new reduced prices? where is that tunnel ? So they axe online sales and expand sales outlets ? Not every neighbourhood is full of convenience stores. @Dave, they’ve already started putting more Myki readers on stations. For instance, Bentleigh got two extra ones on the main platform a few weeks ago, though there is still no vending machine there (it’s on the little-used third platform) – it’s probably about time they removed at least one Metcard machine, leaving the second, and of course people can also buy over-the-counter. @malcolm, I think you’d have some difficulties in getting a refund. @Mark, the most expensive Melbourne trip you can take will be $5.10 after the January price rise, so you won’t save any money by chucking it away and buying a new one for the next trip. V/Line has longer/more expensive trips, but (when it works there) the conductor will come through checking cards and will set the Default Fare to the end of the line, and I assume ensure that the card has enough money on it to cover the trip. @enno, online sales are being scrapped for Metcard only, not Myki. To be expected as part of the transition. And when will they finally fix the issue of the readers not telling you when your two-hour fare expires on Myki? Yes Daniel, the sign on the station does indeed light up at night and it is a sight to see. The letters are brightly lit with LEDs in a rainbow of changing colors. I have had no problems with my Myki card so far other than delayed touch on and touch off times at some card readers. This sometimes holds me up as well as the other passengers behind me. Paper checks are still widely in use in the US and almost all people have and use them regularly to pay bills and would not think it odd at all to receive a check for a refund. Many people also prefer to receive paper paychecks instead of having their employer direct deposit their pay to a bank account. I like living paper check free here in Australia. When I stopped using my concession Myki I got a refund cheque for 6 cents. It cost them more to post the cheque to me than its value! …. and on the refund form that I submitted, i filled out the section that requested a balance transfer to my full fare myki, and they still sent the cheque! Madness! From my cold, dead hands! The hell I am going to give up having unlimited trips in zone 1 for a month for a set fee to some card that you don’t know when it is going to run out. @Tim, not sure what you’re getting at. On Myki you can buy a Zone 1 Pass, equivalent to a Monthly, except you can choose any number of 28 or more days. 2. what is my current status changed from normal user to concession user and vice versa. i think there is no such option to use your myki like this, you have to buy another card. 3. how can i add my children on my account as i am not on concession but the children are on concession. 1. Visitors can buy a $6 myki, then top it up. It’s not the best way but it should work. 2. The normal/concession switch IS unnecessarily complex. Easiest just to have 2 cards; one full fare and one concession and use as appropriate. 3. Don’t know. Shouldn’t be too hard? Myki is about as cheap as metcard, and saves money especially on weekend fares. It’s certainly no worse than metcard in my experience. Try @mykimate on twitter with questions, they are pretty good. Otherwise there’s a public helpline you could call. Hi @Sanjay, Regarding question 3, if get your children their cards from a station or 7-11, then once you’ve got them they can be registered to your account. Otherwise if you order them online, you can do that from your account. If you want to ask the Myki people some questions and get some official answers, as Dave said, talk to @MykiMate on Twitter, or check this web page http://www.myki.com.au/Contact-Us/Contact-Us – which lists their phone number and had a feedback/enquiry online form. The decorations on FSS are Great, puts the rest of the city business to shame execpt for Myers .